When writing my last post on Heimdall, I wondered if his name was connected to one of Freyja’s by-names, Mardoll. It’s usually translated as “Beauty of Light on Water”, perhaps inspired by the sun sparkling on the sea. It’s an appropriate name for Freyja, too, since her father controlled the waters, and she was the most desirable of goddesses. The Scandinavians were a coastal people, who relied on the sea for food, trade and travel. Winter was when ice closed up harbour entrances and people stayed home; sun shimmering on the water meant spring had come and travel could begin again. This entry was posted in Mythology, Norse and tagged Freyja, Heimdall, sun-goddess on May 31, 2018 by solsdottir. After all, the Egyptians seem to have associated the moon with gods: Thoth, Khonsu, Aah. The Greeks, however, saw the moon as feminine, so when the Ptolemies ruled Egypt, Isis became a moon goddess. Isis is a very complex goddess, however, who can’t be defined by any one function or aspect. 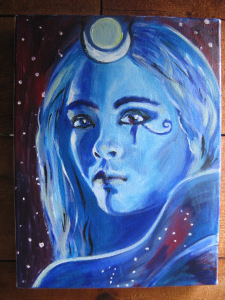 A lovely painting of a lunar Isis by artist Katana Leigh. Visit her site here. Modern Pagans often think of Isis as a Moon Goddess. And, it’s true, in later periods of Her worship, She was indeed associated with the Moon—and, in fact, that’s how She entered the Western Esoteric Tradition. The Isis-Moon connection first started when Egypt came under Greek rule in the 3rd century BCE, following the conquest by Alexander the Great. To the Greeks, Goddesses were the lunar Deities, so as Isis made Her way into Greek culture and hearts, Her new devotees naturally associated Her with the Moon. This entry was posted in Egyptian, Goddesses, Mythology and tagged Isis, moon, sun-goddess on May 24, 2018 by solsdottir. Two Norse deities can be connected to the álfar, or elves, of Norse myth. One is Freyr, who had Alfheim as a tooth-gift, and was ruler of the álfar. The other is the sun-goddess, whose connection with the álfar runs much deeper than her by-name Álfroðull, or Elfin Beam. This entry was posted in Goddesses, Mythology, Norse and tagged alfar, rock art, sun-goddess, Vanir on December 21, 2017 by solsdottir. And may the sun shine and the day’s eyes open. This entry was posted in Mythology and tagged sun, sun-goddess on June 21, 2017 by solsdottir. Sulis is probably one of the more famous Celtic goddesses, even though she only has one cult site, at a thermal spring in south-west England.1 The site, known to the Romans as Aquae Sulis, was not only a spa, but had a temple to Sulis Minerva2, her Romano-Celtic form. This entry was posted in British, Celtic, Mythology, Romano-Celtic and tagged Brigantia, Brigit, cursing, Gorgon, healing water, MInerva, sight, sun-goddess, underworld on December 7, 2016 by solsdottir. It must be tempting, though, to invert the Greek beliefs that shaped patriarchal culture, with its binary of sun/reason/male vs. night/emotion/female. Especially in the form of its most complicit goddess, Athena, who upheld father-right against the Furies’s desire to avenge a matricide. (Although kicking Bachofen and his followers comes about 150 years too late.) Feminizing the Greek sun, and connecting it to those elemental powers, may feel like sweet revenge. This entry was posted in Goddesses, Greek, Modern Mythology, Mythology and tagged Athena, feminism, Gorgon, Medusa, MInerva, Sulis, sun-goddess on November 23, 2016 by solsdottir. The Norse sun-goddess is not alone in her splendour – among her neighbours are the Finnish and Baltic sun-goddesses, Beiwe and Saule. Last week I wrote a post comparing Sol with two major Indo-European sun-gods, Helios of the Greeks and Surya of the Indians, but this time I want to see how much the three goddesses have in common. Comparing her to other sun-goddesses brings out more feminine aspects of her character; for example, spinning was the ultimate in women’s work, so it’s no surprise that the sun-goddesses have to spin their sunbeams. Their daughters, the sun-maidens, do not escape without their share of the work. And all three are nurturing figures, who provide food for animals and people. This entry was posted in Goddesses, Mythology, Norse and tagged Baltic, healing, Sami, snake, Sol, sun, sun-goddess, thunder on November 11, 2015 by solsdottir. The Norse sun-goddess, far from being some sort of Northern aberration, is very similar to other Indo-European sun deities. This shouldn’t come as a surprise, since “basic” deities like the sky, earth and rivers tend to keep their characteristics across a very wide swathe of Europe and Asia. This entry was posted in Goddesses, Mythology, Norse and tagged chariot, Denmark, Helios, Indian, Indo-European, ships, Sol, sun-goddess on October 24, 2015 by solsdottir. Will the real sun-god (dess?) please stand up? It seems almost ridiculous to be writing a post proving that Norse had a sun-goddess. After all, it’s right there in the sources that the sun is a goddess, either a human plucked from the earth to drive the sun’s chariot, or else a being who goes back to the time of creation. This entry was posted in Goddesses, Mythology, Norse and tagged Freyr, Odin, Sol, sun-goddess, Thor, Tyr, Ullr on October 12, 2015 by solsdottir.